Briton Helen Sharman helped blaze a trail for amateur space travellers when she responded to an advert for astronauts in 1989. In centuries to come, schoolchildren throughout the solar system may learn the name of Helen Sharman as well as those of Yuri Gagarin and Neil Armstrong. For she was the first space tourist, selected to go into space simply because she could. Born in Sheffield, South Yorkshire, the chocolate chemist devoted her career to creating a better flavour for Alpine chocolate. She seemed an unlikely astronaut, which was very much the point. In 1989, a group of Soviet space officials had joined Mikhail Gorbachev’s glasnost drive by launching Project Juno. British advertising companies were enlisted to attract an ordinary man or woman to fly to space and raise hard currency. There were many unknowns, including whether an everyday Briton would trust the Soviet space programme with his or her life, but almost 15,000 people applied. 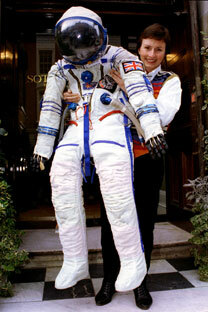 Helen Sharman heard about the opportunity when a radio advertisement proclaimed “Astronaut wanted. No experience necessary.” Eighteen months of training later, Ms Sharman, 27, was ready to go. On May 18, 1991, she and her two crewmates blasted off to the Mir Space Station on a Soyuz rocket. Not counting a $28m working flight to Mir by a Japanese TV journalist in 1990, Helen Sharman’s was the only commercial space tour until Russia sent Dennis Tito, a Californian businessman, to the ISS in 2001. Six more guests have since flown with the Russians, paying up to $35m for trips of up to 15 days. Several private companies are also developing craft to take tourists on sub-orbital flights. Project Juno was a breakthrough in space exploration. Many in the West thought the concept of sending ordinary citizens to space was a joke, and experts in the space industry worried that “amateurs” could not survive the rigours of training and the psychological strain of the mission. But Ms Sharman’s resilience during her eight-day flight earned the respect of her colleagues, and showed the world that the dream of so many to fly to space could become a reality. Despite the failure of fundraising to cover the cost of her ticket – her hosts sent her anyway – the Russians began selling space rides to European space agencies, wealthy Americans and finally even Nasa, which had tried to stop non-professionals from being guests on the International Space Station. The money raised from the space tours may well have bailed out the Russian space programme. And the success of Ms Sharman’s flight paved the way for more recent attempts to create a commercial ecosystem for visitors in low-Earth orbit.